Paper journaling is one of my favorite things to do. I’ve been keeping a journal continuously since 1995. It is an excellent tool for creating focus in your life. When writing by hand you are forced to slow down and think about what you’re doing. It’s a practice of Mindfulness. I use my journal as a diary, a lyric/poem workbook, a sketchbook, and as a place to write down my most personal thoughts. I try to write in it daily and take it with me wherever I go. If you’ve ever thought of keeping a journal, there is no time like the present so let’s get started! This is simple. All you need is a blank notebook and something to write with. I am partial to those old school marble composition notebooks. They’re relatively cheap, very durable, and have a sewn binding which I find ideal. You can use any kind of blank book you want though. As for writing instruments, I prefer to use ball point pens. The ink won’t fade and is much easier to read than pencil. However, you should write with whatever you are most comfortable with. These are some things I like to have on hand when working on my journal at home: spray adhesive, glue stick, scissors, x-acto knife, markers, crayon, stickers, ephemerae, ruler, tape, blender pens, rubber stamps, and ink pads. None of these are necessary for journaling but they can be a lot of fun to use to make your journal look exceptional. Art supply and office supply stores are excellent sources to get materials that you can use with your journal. Another really good place to look for stuff is your local hardware store. You’ll find not only the basic supplies you might need but you’ll also find gems such as aluminum tape used for insulation, copper tape used as snail/slug repellant in the garden, stencils, spray paints, contact paper, die stamps, and copper or aluminum flashing used for roofing. 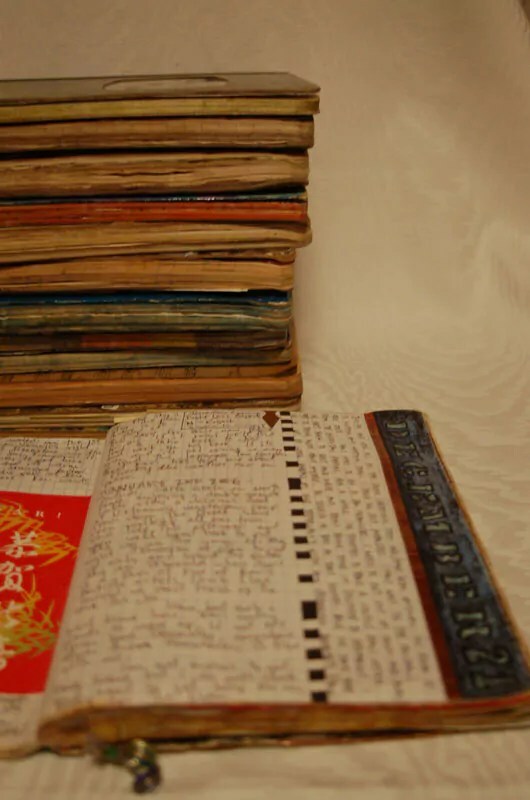 All of these things can be used to make your journal rock. Obviously, the only thing you need to do is start writing in your journal. But, what if you are having trouble getting your first words down on the page? Before I start each journal I like to decorate my covers and come up with a title for it. I start with the title and design the cover based on that. 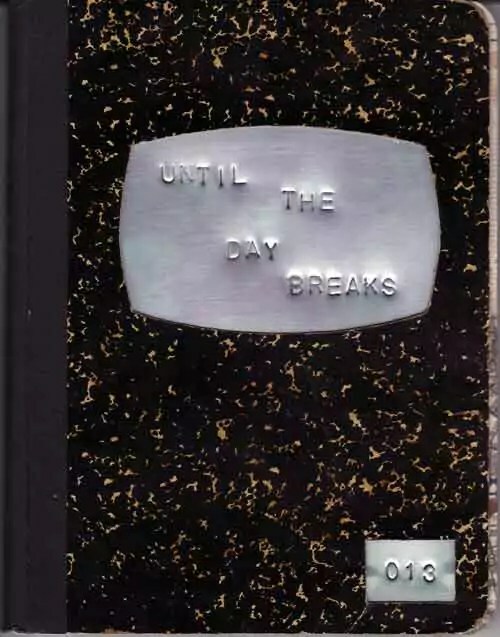 For example, my current journal is titled, “Until the Day Breaks.” This is a line from Song of Solomon that I have noticed on many gravestones here in New England. The full passage is “Until the day breaks and the shadows flee, I will go to the mountain of Myrrh and to the hill of incense.” I loved the way this sounded and thought it would make a great title for the journal. I wanted the cover to be simple and retain most of the “marble” so I used walnut ink to stain the white of the marble for an aged effect. For the title space and the barcode space on the front I decided to replace them with a bit of tin which I hammered the title and journal number into with die stamps. This required splitting the cover stock in half and cutting out the original label and barcode then inserting the tin and reglueing it all back together. The inside title page was made with a map of Pawtucket which I soaked in water and then sprinkled with powdered instant tea. This gave the paper an aged effect that matched the walnut ink on the cover. It worked nicely. The title and design of your journal is totally up to you. You can call it “My Journal” and leave the cover blank but where’s the fun in that? Journaling should not be a chore. Have fun with this. Below is a gallery of all my journal covers since 1996. “What on Earth should I write about?” you might ask. There are so many things you can write about. Write about your day. Write about your frustrations at work. Write poems and songs. Write down quotes you come across in the world. It’s really up to you. NOTHING you write is dumb. One of the main struggles I had when I first started keeping a journal was ignoring the “inner critic.” The “inner critic” would tell me that this thing or that thing I was writing about or wanted to write about was just plain stupid or cheesy. Don’t listen to that “inner critic” when you keep a journal. You’re not writing a novel here so there is no need to censor yourself. Not every journal entry has to be profound. This journal is for you. Think of it as a way to clear your head at the end of the day. If you’re really stuck for something to write about, don’t fret. Collage! Get out your old magazines you might have laying around the house. Cut out words and quotes that speak to you. Cut out pictures that inspire you. Glue these in your journal. One thing I really like to do is have an ongoing theme for each of my journals. Not every entry needs to be about the theme but I find it helps me focus my more serious entries if I have one. One of my recurring themes is the Buddhist practice of Mindfulness. 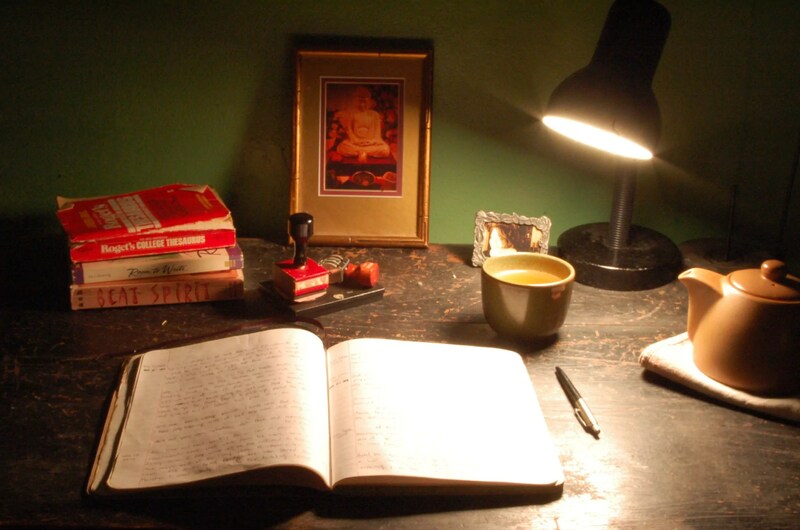 The act of writing itself is mindfulness. Entries may detail everything I experienced when I performed some specific action. For example, years ago when I had to use a local laundromat to do my laundry I would spend the time writing in my journal while waiting for my clothes to wash and dry. I would write about the other people in the place, the sounds of the washing machines and dryers, the smell of detergent and dryer air, the din of the bar next door, and the sounds of the traffic in the street outside. Try this out the next time you’re in doing the laundry, having coffee in your favorite hangout, or riding the bus. Write as much detail as you can. Before you know it you’ll have filled pages and pages in your journal. We all need inspiration at one point or another when it comes to creating things. The same goes for keeping a journal. Inspiration is everywhere. Beat Spirit: The Way of the Beat Writers as a Living Experience by Mel Ash. This book is filled with exercises modeled after writing techniques of Beat Generation authors. The author encourages you to keep a journal while using it. Room to Write by Bonni Goldberg. This book is a collection of writing prompts to spur your creativity. You can write just about anywhere you’d like. At home I usually write at an old school desk I have. I’ll brew a cup of tea and put on my favorite Jazz record and get right down to business. Occasionally I like to go out to a coffeehouse and write/people watch while drinking my coffee. The only important thing about where you write is that you are comfortable. If the sounds of people are too distracting wear headphones and listen to music. If sitting at home feels too isolated get down to your local coffeehouse and write there. Get into the habit of taking your journal with you wherever you go. You never know when inspiration will come. Set aside time to write every day even if it’s only for 5 minutes. Set the mood with your favorite music and a cup of tea or coffee. You rock. Love your dedication to the “word” You KNOW how the “written” word seems to be almost obsolete. Keep it going, in your stories is how we keep history alive and fresh. Through word of mouth in folklore and of course, writing. I’ve always loved your journal covers! Love the image of this writing space. It’s something I kind of lack right now. Probably I need to do something about it.